Shibuya 109 is in a Pinch!? There was an article about “Shibuya109” on the February 17’s NIKKEI news paper. 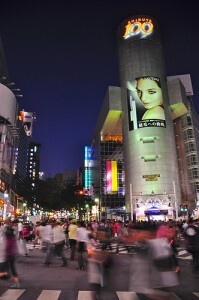 As JAPAN Style previously mentioned, Shibuya109 is a department store in Shibuya, Tokyo, and it is Japan’s fashion capital and tremendously popular among young people. According to the paper, the sales result in 2009 seems to go under than year earlier for the first time in 14 years. On the paper, it reports the cause of the decline. Besides Forever21 and H&M, this store called “Shimamura” deprives young customers from 109 by opening more stores in the locations where young people gather. Although Shimamura was an inconspicuous store for housewives and elders before, now it reinforces its business with the items for young people. The sales of 109 is decreasing, which does not mean that young people lost their interests in fashion but to seek and find cheaper but still fashionable items is today’s trend for them.